As I was walking out the door at 4:30am, I saw lightning and heard thunder in the distance. I was sure that our run would be canceled... I guess that doesn't happen unless there is a hurricane and only if it is a category four. 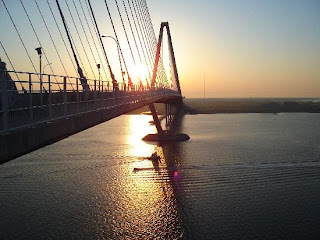 Our route was over the Cooper River Bridge to Downtown Charleston. This is a great route. It has two steep inclines and a lot of beautiful scenery. After going over the Bridge we went down by the Aquarium, past the Custom's House and then by the Market. On our way back, the sun was rising over the Cooper River. We ran our first mile as a group at a slow pace (12:41). When we first started we had a visiting runner from Charlotte drop her key and we all tried to help her find it in the dark. Luckily she found it after just a few minutes. I know I say it all the time, but doing that first mile together and having that time to warm up and socialize really does get you ready physically and mentally for long runs. After the first mile, three of us stayed together and increased our pace (10:50, 10:49, 10:27, 10:23, 10:31, 10:20, 10:32, 10:25). My knees always seem to hurt when I run over the bridge, but it was not too bad today. I think I may be getting used to the inclines. The temperature was already rising by the time we were coming back over the bridge and the rain I was hoping for never fell. As we came back over the bridge we picked up the pace again (closer to our individual marathon pace). This felt fine, but I slowed down when I got to the Old Village (9:06, 9:10, 9:12, 9:40). I had to go by our start and end point to get in my last two miles (this really sucked). I slowed down on my last mile to cool down (10:37). After hanging out for a few minutes to talk with the other runners, I went home and took an ice bath. I recommend ice baths for anyone running long distance. It may not feel great while you are freezing in the bathtub, but the payoff is the way your legs feel for the rest of the day.